Fortuitously, the first time I took my new lens out for a walk, I saw a plane passing near the daytime moon. The image on the left is a crop at 100%, on the right, the uncropped photo as recorded at 200mm on my EOS 7D. As a portraitist and product photographer, I often use short telephoto prime lenses. I prefer the 100mm f2.8L Macro IS USM for tabletop product photography, and the 135mm f2L USM (sometimes with a 1.4x extender) if I need a long reach outdoors or in a convention hall. My favorite short telephoto lens for portraits is the Canon EF 85mm f1.2L II USM, which (on a “full frame” 35mm camera) offers perfect compression and magnification for head-and-shoulders composition for a single subject. This lens is also capable of extraordinarily shallow depth of field effects, which can be hard to master — at f1.4, I occasionally find that my subject’s eye lashes are sharply focused, but the eyeballs are soft. 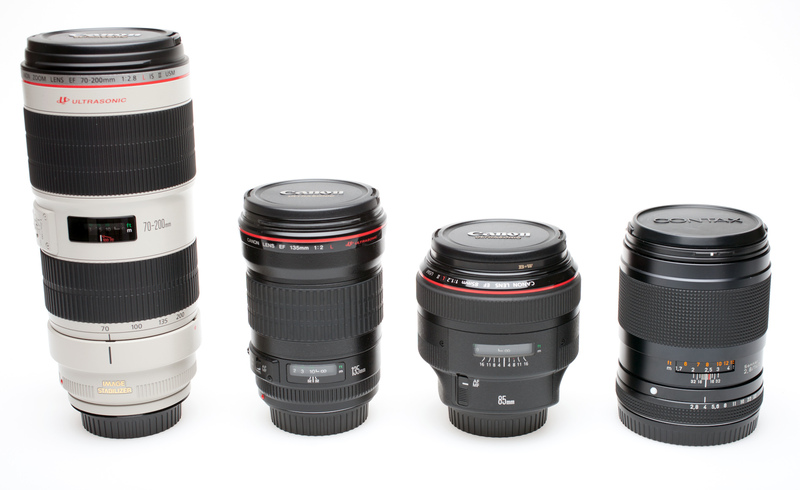 Many of my colleagues forgo this set of several prime lenses and instead purchase a telephoto zoom, which is less expensive (compared to the cumulative cost of three or four prime lenses) and more versatile, especially for event photography, when frequent lens changes could cause interruptions and missed shots. I’ve owned several telephoto zoom workhorse lenses over the years — two versions of the Nikon 70-200mm f2.8, as well as the Canon 70-200mm f4L IS USM. I found that the f2.8 lenses produced acceptable resolution and contrast, suitable for event photography and journalism (but noticeably less sharp than a good prime). The Canon 70-200mm f4 was impressively sharp for a zoom lens, but wasn’t quite as fast at acquiring focus in low light (because the f4 aperture doesn’t allow as much light to land on the autofocus sensors). None of these lenses performed as well as the best primes, and they also had the disadvantage of being large and heavy. I used a telephoto zoom lens for several hours at a wedding in 2008, and afterwards had a tingling sensation in the tips of my left ring finger and pinkie. This tingling persisted for several days, so I asked my doctor about it. He said it might go away, but that it could be nerve damage. A few moths later, with my fingers still tingling, I visited a specialist who performed a nerve conductivity test. He put electrodes on my arm and hand at various points and shocked me, measuring the time it took the electrical pulse to travel across my ulnar nerve. Then he stabbed the needle-sharp end of an electrical wire into the fleshy web between my thumb and forefinger. This wire translated the electrical activity in my nerve endings into an audible signal. We listened together to the scratches and pops that issued from a small speaker next to the examination table. “I’m a photographer,” I said. “I raise and lower my camera, and I support the lens with my left hand — like this,” I said, pantomiming. “How much does your camera weigh?” he asked. The surgery I had in November of 2009 — an ulnar nerve transposition — stopped the tingling in my fingertips and left me with an five-inch scar on my elbow. A year later, my left hand is still weaker than my right, and I have persistent numbness in those fingertips. The surgeon did say that he found an extra muscle in my elbow that only about 1% of people have, and that it was possible the muscle might have been crushing the nerve. He removed the muscle and moved the nerve to a new location on the other side of my arm. The scar on my elbow from an ulnar nerve transposition, possibly the consequence of a repetitive stress injury from using heavy telephoto lenses. So it remains a mystery wether my nerve damage was caused by a mutant muscle or was the consequence of supporting a too-heavy lens for too many hours. I swore off heavy zoom lenses…temporarily. This Fall though, I attempted to photograph a wedding using only prime lenses. This involved a lot of running around and a lot of quick lens changes. Even with two camera bodies, I never seemed to have the appropriate focal length ready at the moment I needed it. At about the same time, I began reading breathless reviews of the newly updated Canon EF 70-200mm f2.8L IS II USM. It was as good, the critics claimed, as any prime. In studio conditions and at identical apertures, the new Canon telephoto zoom is just as sharp as the 85mm f1.2L II USM, the gold standard for short telephoto resolution. The 85 is of course capable of significantly shallower depth of field, and offers a noticeably brighter viewfinder image, helpful for manual focus. (Despite the smaller maximum aperture, the 70-200 will typically autofocus faster than the 85 due to a more sophisticated USM.) 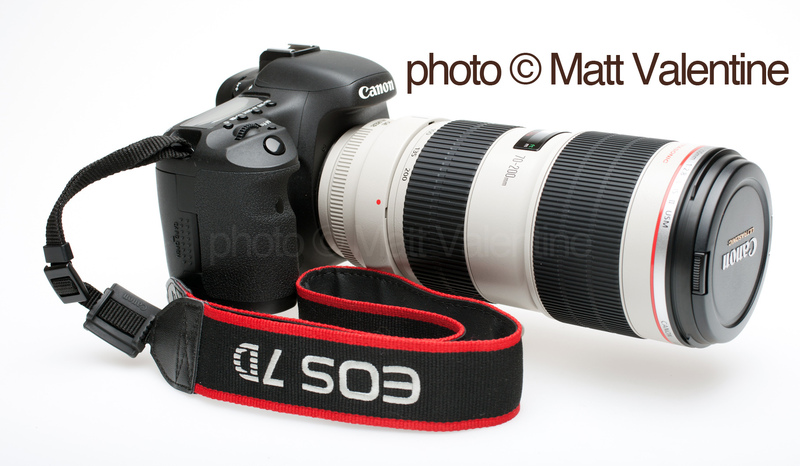 And the 85 is shorter, less conspicuous, and fully a pound lighter than the new 70-200. 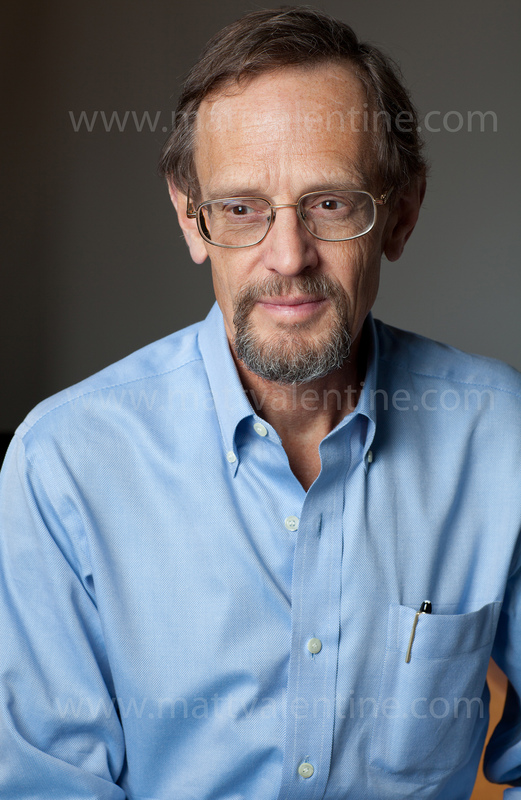 Here are two portraits I made recently of my friend and mentor Paul Woodruff, Professor of Philosophy and Dean of Undergraduate Studies at the University of Texas at Austin. Both photos were lit by Profoto D1 monolights, but with different lighting setups and slightly different apertures (f9 for the first and f14 for the second) so this is not an ideal test, but an imperfect “real world” comparison of the 85mm prime versus the 70-200 zoom set at 85mm, with the same subject and the same camera. 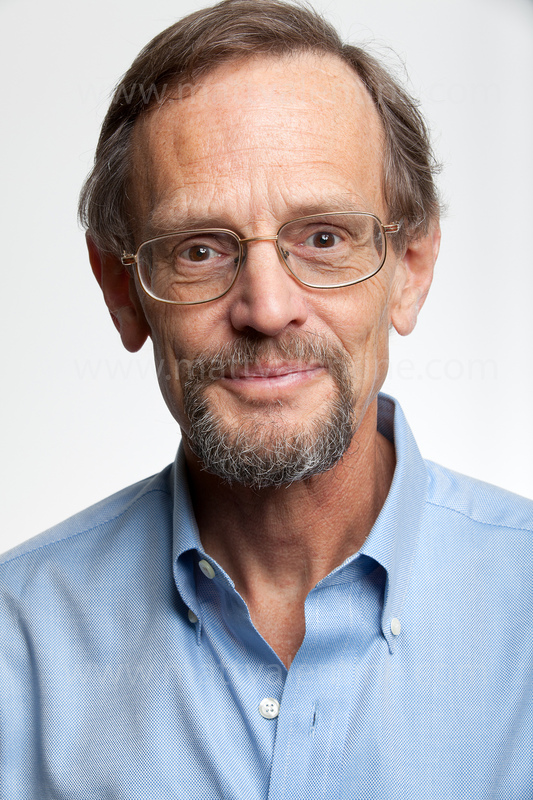 Both of these photos of Dr. Woodruff were shot with a Canon EOS 5D Mark II in RAW, and converted with ACR in CS5 with minimal adjustment and no further retouching. The zoom lens seems to have a bit higher contrast (attributable, perhaps, to differences in lighting.) I don’t see an appreciable difference in sharpness. 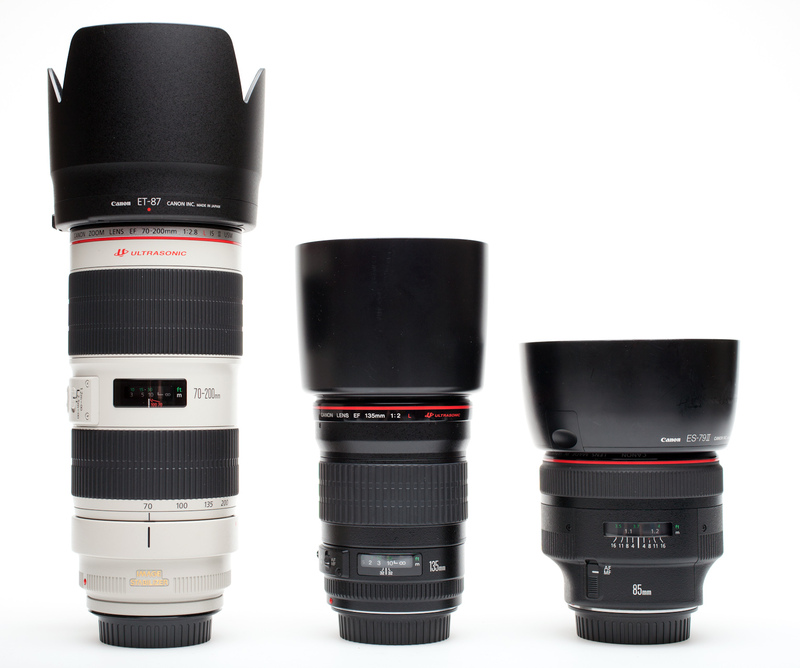 And here let's compare the 70-200 and the two Canon short telephoto primes, all without their lens hoods. For another point of reference, I've included my Carl Zeiss 140mm f2.8 lens for the Contax 645. 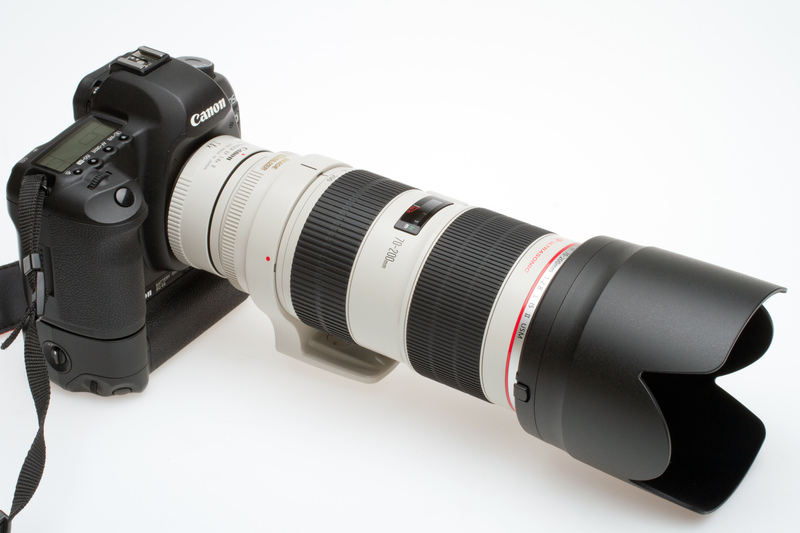 Even measured against a medium format telephoto lens, the 70-200 is a monster. My conclusion: Canon’s new 70-200mm f2.8L IS II USM will produce outstanding results comparable to even the best prime lenses in the same focal range. It is, however, brutally heavy to hand hold and carry. If you need a general purpose lens for tasks including event photography as well as portraiture, get the new telephoto zoom and a monopod to help support it for longer sessions. If you are interested exclusively in a portrait lens, get the 85, which remains superb and will be easier on your arms and on your back. My comment is not in relation to photography however ulnar nerve surgery. Your scar and incision site look so neat. Was this an endocsopic procedure? Also, are you able to tell me who your surgeon was and if the surgery is still showing as successful for you. I am potentially facing this surgery on both arms. My surgery was done by Manish Patel in Austin. I had to take strong pain killers for a couple of days after the surgery. I had plaster bandages on the arm for several days–almost like a cast. Then those were removed and I had ordinary gauze bandages and a sling for several days. I went to physical therapy for five or six sessions. At first I couldn’t do even simple tasks like grasping things, then I regained dexterity in my hand, but with some pain. It’s been a couple of years now since the surgery, and I am still not as strong in the arm that had the surgery as I am in the arm that did not. There’s also a spot near my elbow where there’s no sensation on the skin. I wish I had not needed the surgery, but I guess it’s better than letting the nerve damage progress to the point that your hands don’t work anymore. My mother-in-law had a similar surgery, but her doctor didn’t put the nerve under the muscle like mine did. Her recovery was quicker and she had less pain, and at her age this is probably the right thing to do. But I’m much younger than she is and more active, and it makes sense in my case that, when the muscle was relocated, it was put under the muscle on the reverse side of my arm. That way it’s not so exposed and won’t get hurt in the course of my daily activities. If you’re going to need this surgery in both arms, I certainly recommend only doing one at a time–otherwise you won’t have a free hand to feed yourself, brush your teeth, etc. Good luck–I hope things go well for you. Thank you so much for this information. I do not know personally anyone who has had this surgery so it helps to hear of others experiences. Your incision site looks really small compared with others I have seen. I am glad to hear it was a success for you. Surgery is definitely a last resort option so will have to see how that goes. Thanks again. Two at once would be very difficult.